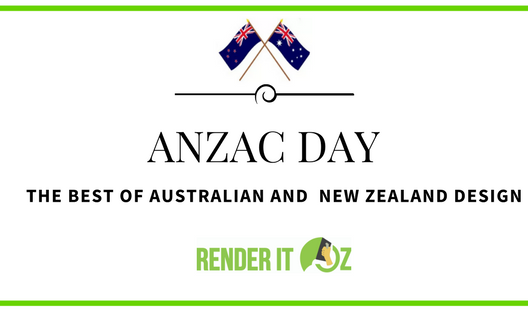 Render it Oz specialise in house rendering and stunning architectural finishes, Venetian plaster, Tadelakt, earthy clay renders, concrete look feature walls and silky Japanese plasters. We work with only the finest products and use the best tradesman and artisans in the business. We work with home decorators, designers and architects to help you rediscover render. Originating in Morocco, Tadelakt is a lime based render product which is naturally waterproof, can be tinted to just about any colour imaginable and creates an exquisite finish to any bathroom or wet area. Tadelakt is also extremely low or no maintenance. It is resistant to mould, moisture and humidity, is cleaned with a simple sponge and if it is installed by Render it Oz, comes with a seven-year warranty. Aside from its aesthetic beauty, Takelakt is 100% natural and has no artificial materials meaning it is not a burden to the environment like its competitors, tiles and other cement based finishes. 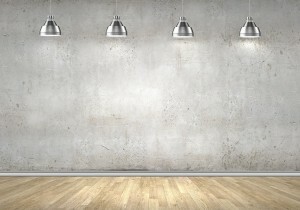 On the design front, the most sought after colour is a light grey, concrete colour because of its industrial look. 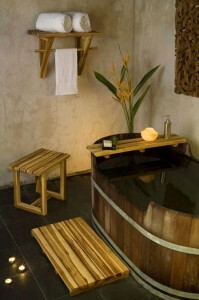 It also goes really well with recycled timber bathroom furniture and accessories. The smooth as glass finish offered by a polished plaster such as Venetian plaster will have you staring at your own reflection for countless hours on its mirror like surface. If shiny isn’t your thing, then ask Render it Oz to finish your Venetian plaster to an iridescent appearance. 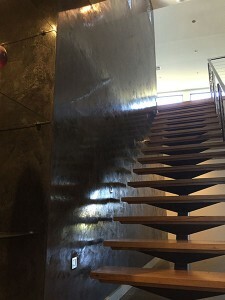 Polished plaster finishes are ideal for creating a unique appearance in any home that will have every visitor asking you what your wall is made out of. Venetian plaster is natural, lime based plaster which is applied by an artisan and burnished to achieve a mirror like, textured finish. 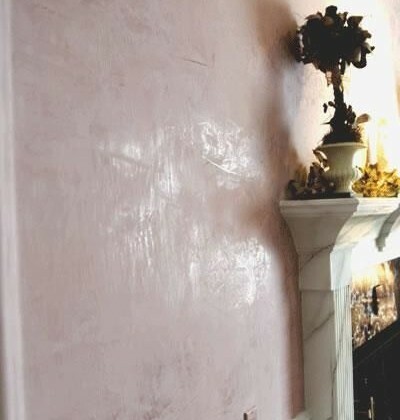 As a lime based plaster, it will perform extremely well in wet areas which where it got its name from – as it could resist the moisture arising from the canals of Venice which would normally destroy cement based or acrylic plasters. 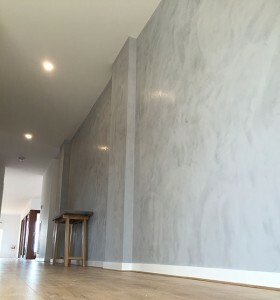 Often referred to as polished plaster, venetian plaster can be tinted to almost any colour you can imagine on your walls and can be used inside or out. 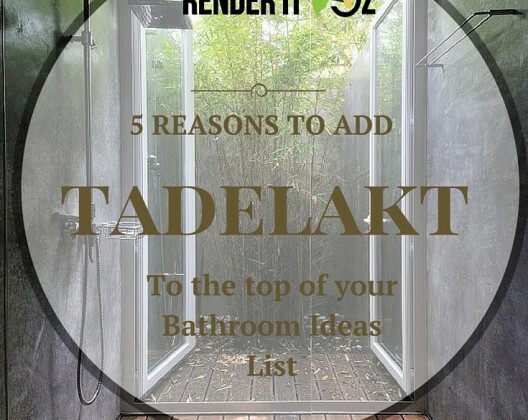 Wet rooms like bathrooms would be better suited to Tadelakt products so if you are thinking to use a decorative finish in your bathroom visit our Tadelakt page. 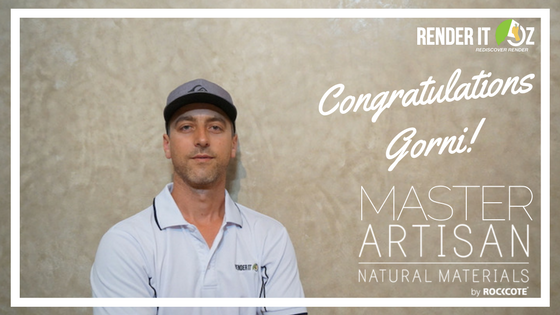 If you are looking for something a little different to add wow factor to your home or are looking at sustainable building or eco homes, then add Venetian plaster to your list of considerations. The industrial look really compliments the look and feel any home, which is why a concrete feature wall can work in any home that is after an industrial feel – even if it is just one room. Investing in decorative concrete wall panels can be extremely pricey. A concrete look wall paper can be damaged easily and is easily identified as fake upon first inspection. 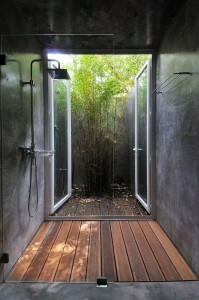 A traditional concrete texture using render is the perfect solution. Our walls create warmth and depth, something only a textured concrete render can bring to a room – with its rough finish that is one of a kind. As an alternative, a polished concrete look, which is incredibly smooth and gives a room strength, masculinity and also crisp, clean and modern. Having Render it Oz come in and do your concrete feature wall by hand means you get a bespoke finish overtime. Applied by hand by a skilled artisan, Japanese plasters add wow factor to any room thanks to their velvety look and feel.